Looking glamorous in safety glasses and face masks, Town staffers pitched in to help build the Habitat for Humanity house, located off Broadturn road. 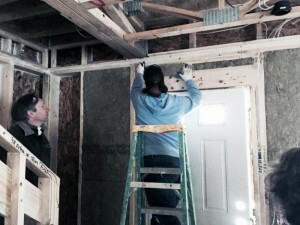 Staffers from the Planning Department SEDCO, the Library and the Fire Department spent a snowy day in February installing insulation in the first home in Habitat’s 13-lot subdivision. The Scarborough subdivision will be Habitat’s largest project in Maine. Contact Laura Duplissis at 207-772-2151 or Click here to email. The current “Welcome Signs” in town have fought the good fight. Having been up for years, they are finally falling over and are ready to be replaced. Here’s preview of the new signs. For more information on the schedule, contact Karen Martin or Dan Bacon. Town Manager Tom Hall addressed members of the Scarborough Community Chamber of Commerce on February 11, 2016 at their annual membership meeting. Town and Country Federal Credit Union hosted the meeting at their new administration building in Oak Hill. CEO David Libby was there to greet chamber members while staff members led guests on tours of the new facility. In his presentation, Hall updated chamber members on local investments in the community from both the private and public sectors. He also highlighted some innovative projects and discussed the Town’s methods of engaging community members in Town governance. 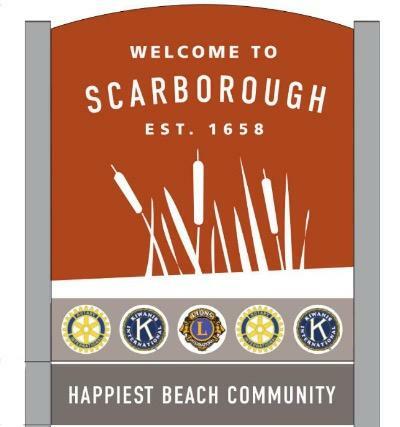 This year marks the fifth year in a row that the Town Manager has met with the Chamber in what has become known as the “State of Scarborough” presentation. To see the slide show in 1.5 minutes – click left. To view a pdf of the presentation – click right. 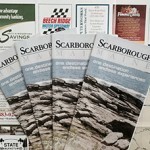 Advertise in the new edition of the Scarborough Community Chamber of Commerce Promotional Map. 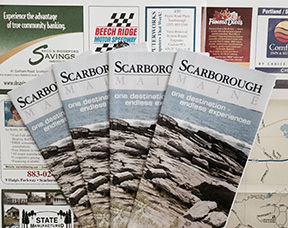 Your ad will appear in 15,000 fold-out maps, distributed throughout the town AND in the Kittery and Yarmouth Visitor Information centers. Not only will your ad appear in the paper copies, you can increase your Search Engine Optimization of your business through an enhanced PDF copy of the map with hot links to your business. Every advertiser will receive 25 complimentary copies of the map. The Scarborough Board of Education would like to invite the business community to take part in the search for the new Superintendent of Schools. Four facilitated focus groups will be held on March 1st and 2nd to obtain input of community stakeholders about the attributes, experience, and knowledge they believe the next superintendent should possess. The focus group designated for Town and Business Leaders will be held on Tuesday March 1st at 7:00 pm in the High School Multipurpose Room and will last approximately 1 1/2 hours. 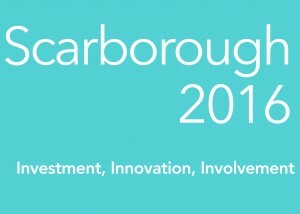 All Scarborough residents are invited to attend. The Scarborough Board of Education and NESDEC hope that you will be able to participate. If you have any questions or would like more information, please contact Donna Beeley, board chair, at dbeeley@scarboroughschools.org.